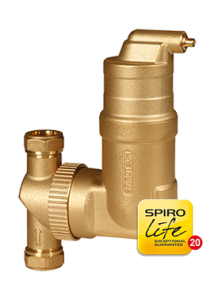 The Spirotech RV2 deaerator is designed to automatically remove air from the central heating system which prevents corrosion and increasing reliability and efficiency. The Spirotech RV2 comes with 20 years free warranty. Can be mounted and put in use in only a few minutes. Effectively removes circulating air and micro bubbles. Inhibits the formation of corrosion products. Puts an end to gurgling and other irritating noises. Removes air inclusions and prevents cold radiators.